The Rebel Sweetheart. : Hair Story | Palty Bubble Hair Color in Raspberry Jam. Hair Story | Palty Bubble Hair Color in Raspberry Jam. For the past twelve months, I've been using Etude House Bubble Hair Coloring to dye my hair. In my first attempt at DIY hair coloring, I used the Sweet Orange shade. A few months later, I switched to Gold Blonde,which was the shade I stuck to for the rest of the year. I've been wanting to try Mocha Pink for the longest time, but this shade is just so elusive that three of the Etude House branches I've been to don't have them in stock. I tried purchasing online and still no luck. I took this futile search as a sign to finally switch brands - and with that, I'm turning Japanese. Palty Bubble Hair Color in Raspberry Jam. This my friends is Palty - a brand of hair color products manufactured by the popular Japanese corporation, Dariya. 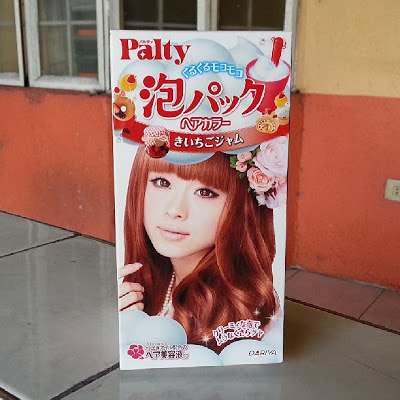 From what I know, Palty has several collections of hair color products available in the Japanese market (e.g. Hair Bleach Collection, Hair Turn Color Collection, the classic Hair Color Collection). The Bubble Hair Color Collection is the only line I've seen so far in Watson's and at SM Department Stores, and they sell for Php 499 (around $12) per box. They have 15 shades in this collection, and the one I chose is Raspberry Jam. Inside the box are the following items - a mixing cup, a stirrer, the base water oxide, the Raspberry Jam color cream, a sachet of hair treatment cream, a pair of latex gloves, and the instruction manual written in both English and Japanese. Now here's a quick rundown of how to use this product. 1) Shake the base water thoroughly in an up and down motion at least 20 times, then pour the contents into the cup. 2) Next, add the entire cream mixture. 3) With the tip of the mixer, pat the cream lightly around 5 to 6 times so that it blends with the base water. 4) Then, mix in a circular motion for at least 20 times. 5) Foam will appear once you start mixing. Be warned, there is a tendency for the foam to overflow. 6) Once the foam subsides and the pinkish color appears, you can now apply the hair color to your hair. 7) Leave it on your hair for 20-40 minutes. 9) Apply the hair treatment cream, leave it on for five to ten minutes then rinse. - Product is easy to use. - Affordable price (though it costs a bit more than Etude House or Tony Moly). - Product smells fruity, chemical scent not overpowering. - Does not damage the hair. - Treatment cream leaves the hair soft and smooth. - It's a bit messy to use, with the overflowing bubbles and all. To a soft brown, with a hint of red to it. These photos were taken 24 hours after I dyed my hair. It looks good.. very natural.. does it cover white well.. am looking to dye my hair again this holidays. This saves you a lot of money compared to having your hair dyed in a salon. I haven't ever used this brand of hair dye, but I used to dye my hair at home because it was so much cheaper than running to the salon every few weeks for a touch up. I loved dying my hair an auburn color but my husband talked me out of it a few years ago. I have been thinking of dying it again but haven't yet. I like the color. It's a nice, warm shade that looks good on you. I thought it would be lighter judging from the picture on the box. Beautiful color. I've tried DIY and found it was too hard to get what I wanted, now I have my hairdresser do it.